The gilding kits for sale here will enable you to achieve all the types of finishes contained on this website including the crackle glaze and antique glaze. 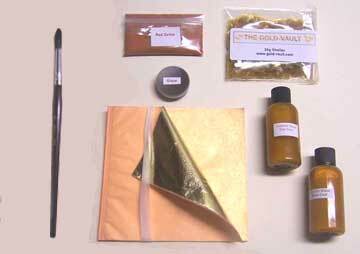 The full instructions for these gilding kits are contained within the manual which is free to download here. How to Achieve Antique and other Distressed Finishes to Dutch Metal Leaf. Old cast iron door knocker which has been gilded using imitation gold leaf with the materials contained in the standard gilding kit. Due to restrictions on hazardous chemicals being sent through the post, I am unable to sell the size which I recommend, ready mixed, however all you need to make this size is methylated spirit (denatured alcohol) which is available over the counter in most countries, it is profoundly simple to mix and apply. 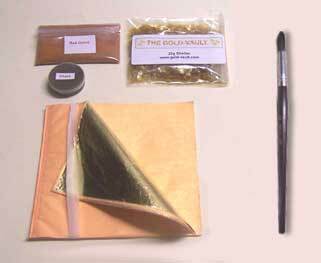 There is sufficient in these gilding kits to treat several A4 or letter sized picture frames, you can purchase additional materials if you need them. When I launched this site in 2002 I knew shellac would play a large role, back then it wasn't a problem, as shellac wasn't that expensive, however things have changed. During the last five years in particular, due to poor harvests in India and Pakistan, the cost of blonde de waxed shellac, the type I use, has risen dramatically, so it is no longer the cheap solution it used to be, but it is still an extremely useful material which I use in my method of gilding onto metal or wood and in producing vellum effect and parchment papers. This is an example of the Standard Antique Finish, it is simple to execute and very effective, particularly in the way this finish reflects light. We found this a very economic method of antique gilding picture frames. I feel this finish is particularly suited to the treatment of large wall panels. 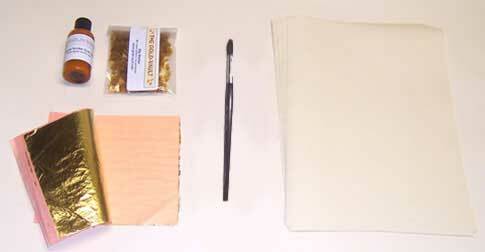 An economic gold leaf kit. This is an example of what you can achieve using the Crackle Glaze Kit. Many people who are new to gilding have heard of the crackle glaze and want to know how to do it. I have tried most commercially available crackle glaze, some rely on oil and water varnishes which are difficult to judge due to temperature and humidity variations. The two part crackle glaze I sell here is very reliable indeed, I would say foolproof under normal working conditions, it is an acrylic based medium and is simply painted on with a brush. Of course with this kit you are also able to produce the Standard Antique Finish. The Professional Kit enables you to obtain both the Standard Antique Finish & the Crackle Glaze finish, but it also opens up working with gesso, this is an example of the effect you can simply achieve using this kit. I give clear instructions on how to mix and prepare gesso, it is not difficult to achieve this sort of finish. Neither is it necessary to have expensive equipment. The Crackle Glaze Gilding Kit. Price £34.99 This includes shipping by airmail to your door. The fine crack glaze used in this kit will give dependable results that anyone can achieve providing the simple instructions are followed. 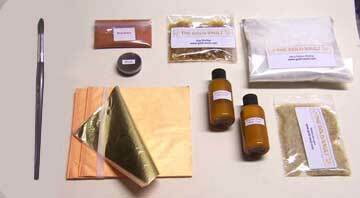 The Professional Gold Leaf Kit...Price £45.99 This includes shipping by airmail to your door. Shabby Chic Kit, comprising 50ml each of the 2 part crackle glaze and a 10g pot of burnt umber colour antique glaze. This should be enough to treat a medium sized table or chest of drawers. Sufficient for 5 A4 projects or 15/20 seasonal cards. What you will run out of first is the paper and the shellac, these are available from the gold leaf supplies page. 5 A4 sheets 200 gsm Cartridge paper. 50 ml Simple Scribe gold adhesive. 1 book of gold metal leaf. Here you will find further gold leaf supplies. EVERY MONTH I SEND OUT A NEWSLETTER WHICH AIMS TO BRING YOU INTERESTING ITEMS CONCERNING THE WORLD OF GILDING AND RELATED CRAFTS. IF YOU WOULD CARE TO SUBSCRIBE PLEASE JUST MAIL Richard at gold-vault@orange.fr and put "gold-vault" in the subject box. Hi there, I've been browsing your wonderful website and I can't wait to have a go at some of the techniques you explore on there. Your manuals are definitely the best Iv'e found on the internet. I just want to salute your generosity in giving away your gilding knowledge. Excellent guide books, I was not able to find such a simplified explanation in any book at the local library. You did a brilliant job of mentoring me through my project, it turned out very well, I am extremely happy with the results. Your manuals are excellent. I easily worked my way through your gilded manuscript project and the result is now framed and hanging in my living room. Thank you. 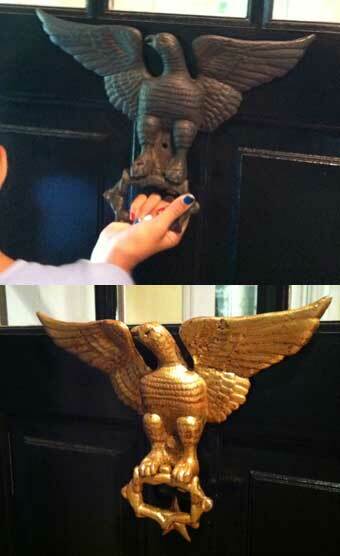 Imitation or Genuine Gold Leaf?